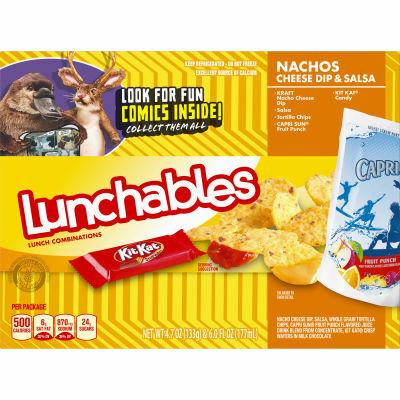 Make lunchtime something they can dip into with Lunchables Nachos Cheese Dip & Salsa. Made with tortilla chips with 8g of whole grain, Kraft Nacho cheese dip and salsa. Includes Capri Sun® and KIT KAT®. A delicious, convenient, and fun option for school, picnics, or on-the-go lunch. Good source of Vitamin C. Each box is 500 calories.